However, there's still a long way to go before we'll have individualized replacement hearts. Over a third of Americans who need a new heart will not get the transplant they deserve in the upcoming year. And those lucky enough to receive one still run the major risk of their body rejecting it. However, researchers from Massachusetts General Hospital and Harvard Medical School have announced that they’ve successfully used adult skin cells to grow functional human heart tissue, according to a new report published in the journal Circulation Research. Other researchers in the past have managed to grow the tissue, but these scientists have figured out a way to construct the architectural scaffolding upon which hearts can grow. In their previous research with mouse hearts, these scientists pioneered a way to use a detergent to strip a donor organ of anything that may trigger an immune response, before introducing stem cells into that remaining “matrix.” This provides the foundation, or scaffolding, for a newly grown heart. They did the same in this recent study, but with human adult cells instead. 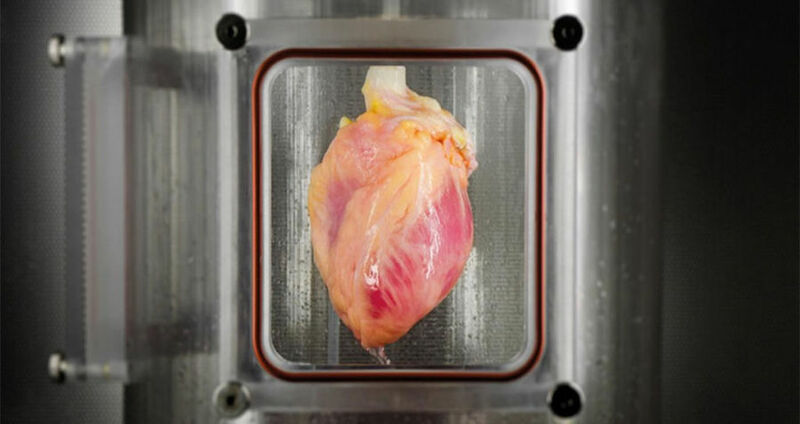 After soaking the hearts inside a nutrient-rich solution, they grew the tissue in similar conditions to what a body subjects to a growing heart. After two weeks, the researchers shocked the human heart tissue and were delighted to find that it started beating. The tissue itself looked very similar to how immature hearts are structured naturally. Now, the final goal for these researchers is growing an entire working human heart — but they still have a way to go. Modern medical science hasn’t reached that point just yet. They first need to increase the amount of stem cells that they can harvest — because creating a whole heart takes tens of billions of cells — before speeding up the time it takes for a cell to mature. Lastly, they need to refine the conditions in which they grow the hearts, mimicking real-world conditions even more. Once those hurdles have been cleared, these scientists will have revolutionized modern medicine even further. Next, read up on the treatment meant for Alzheimer’s that also regrows human teeth, before checking out how this pioneering procedure cures infants’ leukemia and could revolutionize cancer treatment.